Although Edinburgh is an outstanding city to drink great beer in, it would be fair to say it doesn’t have a beer festival to match. However, the Edinburgh Craft Beer Festival – which runs until tomorrow – might be about to change that. Held at the Biscuit Factor on a tropical bank holiday weekend, it is impossible to imagine any better venue than this post-industrial shell in Leith. So, the venue – drenched in sunshine – is spot on. And the beer selection is outstanding. There is the best of Scottish and UK beer, including Beavertown, Cromarty, Fallen, Fierce, Pilot, Siren, Thornbridge and Wiper and True. And some of the best breweries from the rest of the world are represented, including Aegir Bryggeri, Brooklyn, Dugges, Firestone Walker, Sierra Nevada and Yeastie Boys. It’s an impressive line-up. 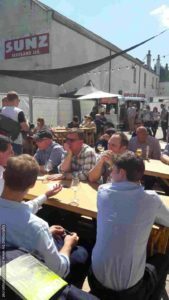 In what I think is a first for a Scottish festival, you pay a flat fee and can drink as many of the small pours as you like. 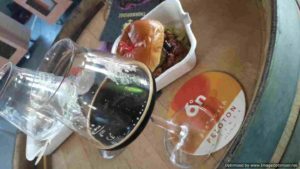 I’ve never been a great fan of that set-up, but my doubts are quickly dispelled and it works perfectly – allowing one to sample a wide range of the great beers offer. And what beer. Too many highlights to mention, but the pick of the bunch from yesterday’s session were the tropical Tasty Juice from Lervig, tart citrus Spontanyuzu from Mikkeller and dank and fruity Apocalyptic Thunder Juice from Admundsen. I lost count of the good beers I had – but those were the stand-outs. The Biscuit Factory feels like an ideal venue – spacious, quirky and a bit ragged – for a beer festival, and it’s surprising it hasn’t been used before. There are food stalls outside, as well as beer and merchandise stalls inside. 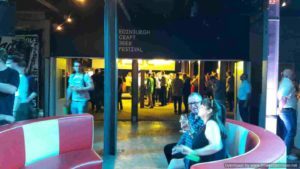 So, it’s early days – but the Edinburgh Craft Beer Festival has made a powerful debut and already feels indispensable, and up there with the best beer events in the UK.